The Colts have had a bumpy season so far, but they can at least boast about one thing. They didn&apos;t just defeat the Texans last night (which, if you saw their offense, is not that noteworthy). They defeated J.J. Watt, the man sculpted from the inner temples of Valhalla. For just the second time in his NFL career, Watt finished with no solo tackles or sacks. And the Colts had no problem reminding you of that. In its website&apos;s notebook, they made it a point to mention that the squad neutralized Watt. That&apos;s definitely not untrue, and the offensive line does deserve credit for doing so. What&apos;s interesting, though, is the quote the website included from tight end Dwayne Allen. 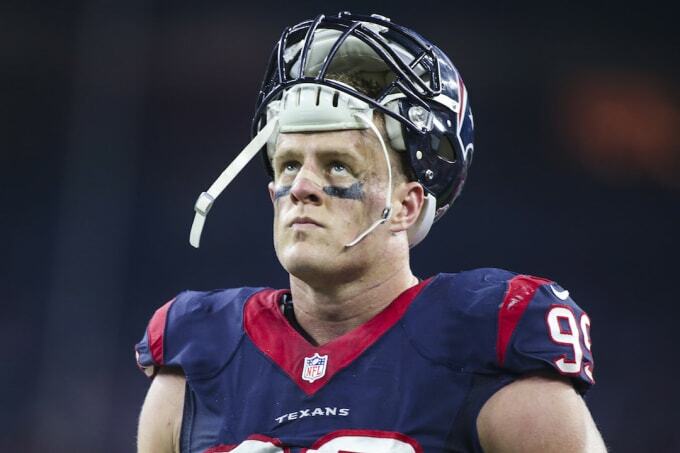 The Colts dominated J.J. Watt so much that he&apos;s not even J.J. Watt anymore. “Justin James (Watt) is arguably the greatest defensive player in this league and for him to have a quiet night, attributed to a short week and great coaching,” Allen said. Justin. James. Watt. Full name and everything. Can&apos;t say that to a dude who freelances as a God of War boss. Allen better be under a roof, or he might be struck by lightning.